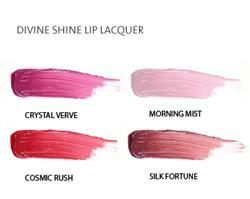 Face of Australia Divine Shine Lipgloss is available in four shades, Crystal Verve, Morning Mist, Cosmic Rush and Silk Fortune. Ultra light-reflecting pearls ensure the perfect, full pout can be yours with a swipe of Divine Shine. Light reflecting pigments produce stunning high shine results. Smooth coverage evens lips and makes them look fuller. Enriched with natural emollients to moisturise and condition lips. The easy to apply wand applicator provides even coverage.